Underarm stains are unsightly, especially on white shirts. Frequently, commercial stain removers do not completely remove the perspiration marks, but home remedies can make short work of cleaning the stains thoroughly. 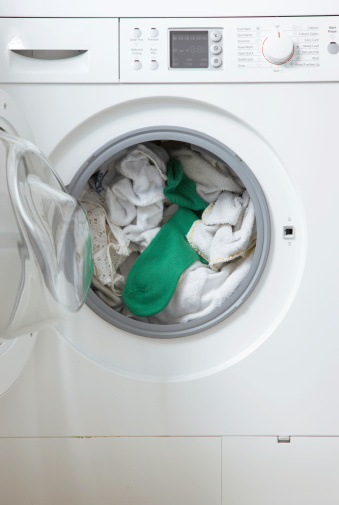 Inspect the clothing after laundering and before placing it in a dryer as drying can set stains and make them more difficult to remove. Home remedies can be very effective on underarm stains. Heloise, of Hints from Heloise, recommends that the best method for dealing with underarm stains is to prevent them before they form. Allow your deodorant or antiperspirant to dry completely before you dress. Deodorant and antiperspirants have ingredients which react to chemicals in sweat that cause yellowed stains. Letting those chemical reactions disperse keeps the stains from attaching to your clothing. 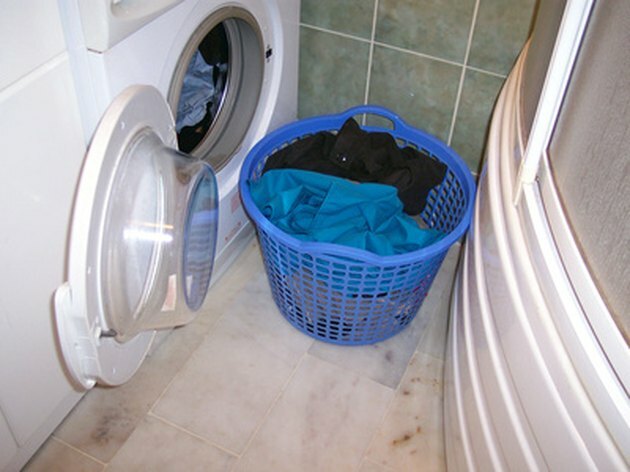 Before laundering, rub full-strength liquid laundry detergent into perspiration stains, and wash as you would normally. Applying the detergent to the stain directly allows it to begin working without water, and the additional detergent in the wash cycle serves as a second dose to attack the stain. Either white vinegar or apple cider vinegar works well on older perspiration stains. Dab the vinegar onto the stain, and launder the garment as usual. If you only have apple cider vinegar, you can still use it to remove perspiration stains because it does not stain clothing. Heloise recommends that if you normally wash your clothes in cold water, instead wash your white clothing in hot water every third or fourth washing, which helps your detergent to remove perspiration and other stains. Crush two aspirin, and mix them into 1/2 cup of warm water. Soak the stained part of your garment in the aspirin and water for at least two hours, and wash as you normally would. Use a clean cloth or sponge to dab equal parts of ammonia and water onto the perspiration stains. Although the ammonia smells strong even when diluted, the smell will wash out. Wash the stained garment as you normally would. Rub equal parts of lemon juice and water into the underarm stains. The acid in the lemon juice helps to break up the perspiration stains. Wash the garment as usual afterward. Mix 1 qt. hot water with 4 tbsp. salt. Use a cloth or sponge to dab the salt water onto the stained clothes until the stain disappears. Repeat as needed, and launder the garment as usual. Add 4 tbsp. baking soda to 1/4 cup of warm water. The mixture should form a paste. Rub the paste into the underarm stain, and allow it to dry. Leave the paste on the stain for at least two hours, and wash the clothing as usual. How Does Vinegar Keep Colors From Fading? What Causes White Stains on Dark Clothes?